Since the mid-20th century, a broad range of experimentation in the form and style of photography has occurred. Experimentation in all types of modernism by artists after World War II (1939–1945) led artists to ignore the traditional distinctions between visual media. Photographers, like other artists, reevaluated the assumptions about photography (as opposed to “fine art” painting) in order to extend the range of possible expression beyond pure documentary photography. The medium was not only integrated into mixed-media events and assemblages, but also became an important record of non-permanent modern art. It also has continued— what from the beginning was deemed vital to early photographers— as a source of documentation of what is going on in the world, be it good or bad. Light, Sweet, Crude is an ongoing project that Brook Reynolds began in 2007. Educated at the University of Georgia, she lives and works in North Carolina. In the late twentieth and early twenty-first centuries, photography of landscape and contemporary artifacts taken without emotional shading have been called New Topographics. This contrasts interestingly with the non-emotional survey photographs taken by nineteenth-century artists cataloguing the western territories. In both instances, the artist was shooting the image with the intention of evoking an emotional response from the viewer. In the case of artists such as Timothy O’Sullivan (1840–1882) the aim was to inspire awe in viewers of the then little known or explored western territories after the Civil War (1860–1865). 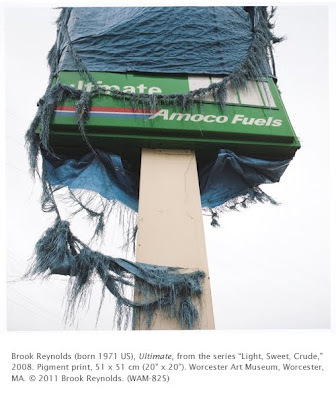 Reynolds works from the perspective of a viewer of the diminishing, spoiled eco-system of the U.S. Light, Sweet, Crude addresses America’s obsession with the car and the damage being done to the environment because of it. The series focuses on a number of abandoned gas stations that symbolize not only America’s overwhelming obsession with cars and driving, but the harm petroleum products do to the environment, especially in abandoned gas stations where the buried gas tanks continue to leak into the environment.